BLaST IU 17 and CSIU16 held its first annual regional PIIC winter retreat where IU mentors gathered to collaborate and help refine the coaching practices of the administrators, teachers and specialists in attendance. The Pennsylvania Institute for Instructional Coaching (PIIC), is a state initiative whose miss ion is to support instructional coaching which helps teachers strengthen instructional practice, increase student engagement, and improve student learning. PIIC is a grant-funded project through the PA Department of Education. The group was welcomed by Dr. Christina Steinbacher-Reed, Executive Director of BLaST IU 17. She thanked them for coming and shared her passion for coaching and its importance in helping to move learning forward. 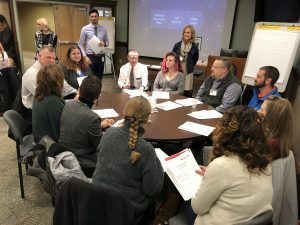 The theme was Learning In A Winter Wonderland and IU mentors worked with instructional coaches on ways they could coach others to lead with enthusiasm and harness their passion to coach and encourage staff and students. They first learned how to identify their own strengths as leaders with an initial medicine wheel ice breaker. All were asked to do some self-reflection and identify what gifts he/she brings to their team. The importance of knowing your passion and the gifts of those with whom you work was key in the training. 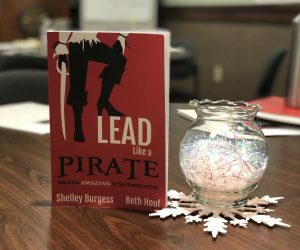 The keynote speaker was Beth Houf, author of Lead Like a Pirate: Making Schools Amazing for Your Students and Staff. “Pirates are all about doing whatever it takes,” she said, even if that means wearing costumes and singing karaoke. The group had read her book and listened to Houf share her passion about developing schools that encourage high levels of learning and empowerment for all. “Do not be afraid to lead,” Houf said. “It’s a partnership, and you should take it where you can make it work.” She thanked the group for being the ones who make it happen every single day. The registration for this event was free and open to all school district instructional coaches. Participants were encouraged to continue to collaborate as they took their enthusiasm back to their school districts.